In the idyllic Théoule Miramar, between the red tip of the Esquillon and beach Figueirette. 5km from Theoule center and its shops. Quietly, in a green, 35m2 terrace (facing south-west) and Mediterranean garden of 50m2. Sea view from the terrace. 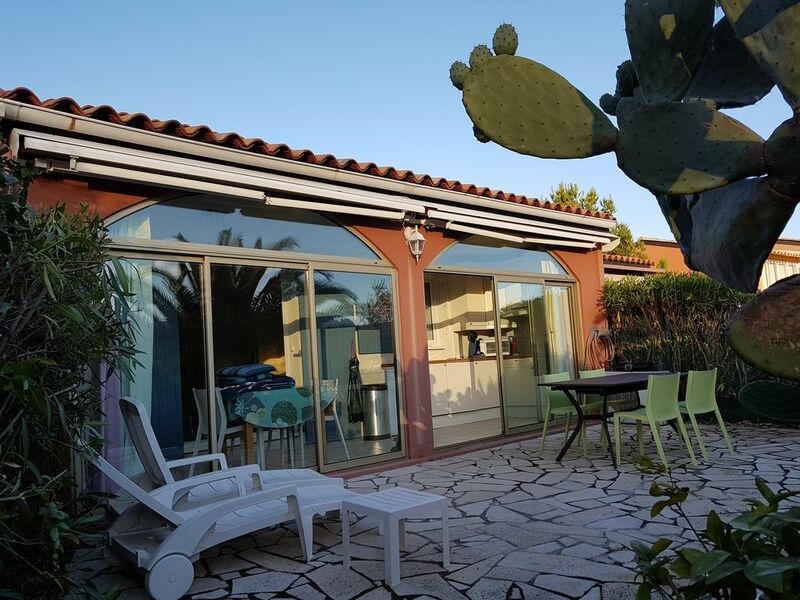 Modern house of 40m2 fully equipped (video, washing machine, dishwasher, oven, microwave, freezer, air conditioning in conservatory / kitchen / living room). In a pleasant, leafy residential, occupied mainly by year-round residents, secured by code and caretaker, beautiful communal swimming pool with children's pool. The person who makes the keys lives 50 meters away. Attention Miramar is a small coastal village away from the nightlife of Cannes or Saint Raphael. If you want to go out in these high places of summer tourism, a few minutes of car are necessary! The nearest beach (Figueirette, sand, gravel) is 800 meters. Possibility to get there by car (easy enough parking, even in high season) or on foot. Possibility to rent sailboats, motor boats (with or without license) and kayaks. The coastal road to St Raphaël, between sea and Esterel offers many beaches. To Theoule and Cannes, we recommend the Aiguille beach (sand and red rocks in the water, water course 3 km), Theoule center beach (sand), La Napoule beach (sand, next to the Castle ), Casino (sandy beach, opposite the Golf), beach Bocca (sand), and the beaches of the Croisette in Cannes (sand). Many possible walks in the Esterel from the villa. Très bon séjour. Cadre parfait. Terrasse magnifique : vue sur mer et montagne. Grandeur du logement idéale pour famille de 4 personnes. Clim très appréciable. 800 m de la mer à pied. Piscine de la résidence adaptée, et jamais bondée. Environnement calme. Région magnifique. Propriétaire sérieux.